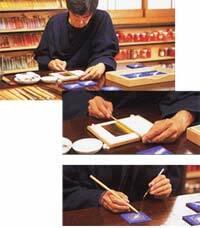 Pigments made from natural minerals are rare and expansible, but its colors are indispensable for the Japanese style painting. There are two kinds of mineral pigments: natural pigments and artificial pigments. 1. Select minerals that suitable for pigments and crush them into fragments. 2. Screen out the fragments and reduce them to a fine powder. 3. Remove impurities through elutriate process and sort powders by the size of its grain. 4. Remove impurities again and dry under moderate humid condition. Blue Verditer - produced from azurite. Nowadays, brightly colored natural blue verditer is less commonly available. Green Verditer - produced from malachite. It is made out of copper carbonate and hydroxide copper. Distemper is the colors produced from argillaceous soils through levigate process. Compared to minimal pigments, it have a fine texture to mix and paint easily and have a wide range of colors. It is the basic color for the Japanese painting. 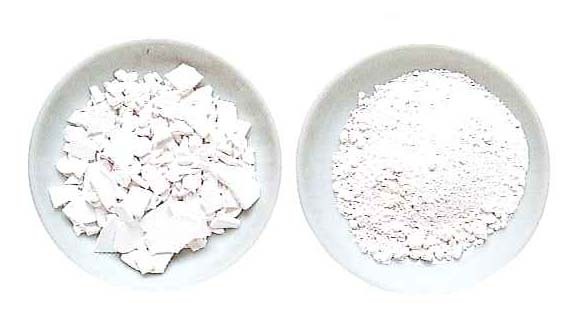 In the old times, distemper are proceeded only from natural ingredients but nowadays, sun fast pigments and dyes are mixed with whiting and white clay to provide wide range of colors. Although the name and shades of colors vary based on manufacturers, most of the colors contain Japanese taste. 1. Crush ingredients in to fragments, and mix with water to remove impurities. Repeat the procedure to distillate ingredients. 2. Mix ingredients or heat to produce color. 3. Fit in large pot and wash with water. 4. Fill pigments on board and dry in the sun or dry under natural condition. Yellow Ocher - Produced from weathered soil containing weathered ironstone and feldspar. It is one of the colors that been used since ancient times. Vermillion Ocher - Red brown color produced from iron oxide. High-quality vermilion ocher has deep color that resembles stubbed vermillion. Red Ocher - Reddish brown color produced from soil containing iron oxide and small amount of manganese. Whiting - From ancient times, whiting was one of the essential colors that used in Japanese Painting. It has various uses from white color to mixing with other colors. The main ingredients are calcium carbonate and contain small amount of phosphoric acid carbonate. The materials are produced from oyster shells and clamshells, which are weathered for long time, crushed into fragments, remove imperfections, and dried in the sun. Although the names of the product differ by manufactures, whiting that are finely processed are high graded from tokkyu (highest quality), first to fourth grade, and moriage (low quality for raising groundwork). 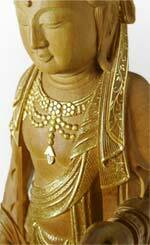 Kirikane is a technique for decorating Buddhist sculptures and paintings that has developed in Heian Period. Cut gold and silver leaves into thin lines, tiny triangles or squares are carefully arranged by brush and glue on to sculpture and/or paintings, creating precise and subtle ornaments. This technique was brought back from Tang China through Asuka to Nara era. Inheriting aesthetic of aristocratic culture, it reached its apogee in around 12 Century. Buddhist sculptures and paintings have fine Kirikane ornaments in that time such as Shaka Nyorai in Jingoji, Kyoto, which is the finest Nyorai paintings in Heian era. Later, Kirikane technique declined with Buddhist art, as aesthetic values change with the politics shift from noble to samurai. After early modern period, the technique was scanty inherited by small number of artisans with the patronage of East and West Hongwanji temples of Jodoshinshu School. It became known to society after Sayoko Eri designated as a Living National Treasure in Kirikane. In the early Showa period, the number of artisans declined to several people but in the postwar period, people appear to pick up the technique or willing to inherit the technique.